Saudi Arabia's King Salman has ordered the country's National Guard -- considered the Kingdom's best trained and equipped military force -- to join the military campaign against Iranian-backed Shiite rebels in neighboring Yemen. National Guard troops had already deployed along Saudi Arabia's southern border with Yemen, but the order from Salman on Tuesday could pave the way for a long-discussed ground incursion into Yemen to confront the rebels, known as Houthis. The Saudi-led coalition pounded Shiite rebels in Yemen on Tuesday, killing 20 in a city in the country's west as the civilian death toll rose to 38 from airstrikes the day before in the capital, Sanaa, officials said. The National Guard is under command of a separate ministry in the Saudi power structure, answering directly to the monarchy, whereas the Air Force and the Land Force -- the only military branches deployed in the Yemen campaign until Tuesday -- are under the command of the Defense Ministry. The U.S. backed campaign by Saudi Arabia and its allies, mainly Gulf Arab countries, is aimed at crushing the Houthi rebels, who have taken over Sanaa and areas in northern Yemen and have been pressing an offensive to expand their gains in the rest of the country, including the southern port city of Aden. The ground fighting and the airstrikes have pushed Yemen, the Arab world's poorest country, to the brink of collapse. 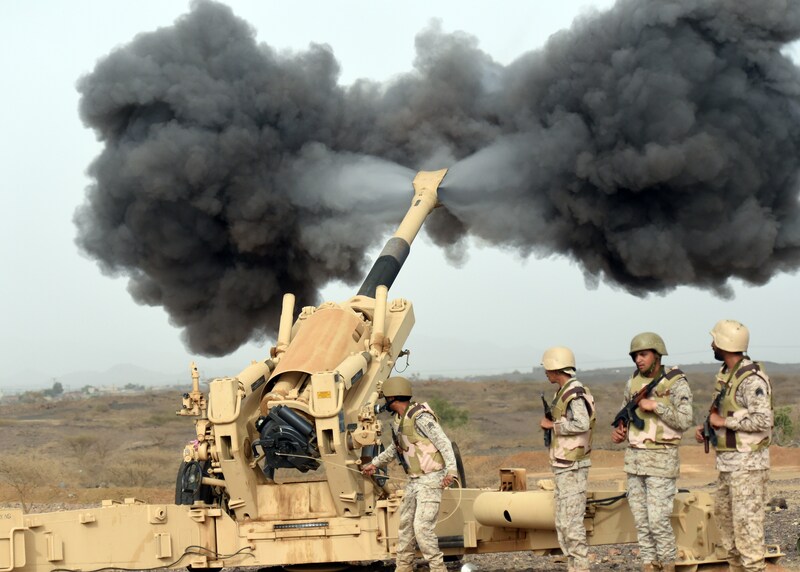 The fighting has also taken on the appearance of a proxy war between Iran, the Shiite powerhouse backing the Houthis, and Sunni-dominated Saudi Arabia. CBS News analyst Jere Van Dyk, who spent much of last year in Yemen, says King Salman's order is significant, noting that the last time the royal family called up the National Guard to any significant degree was in 1979, when a group of Islamic militants -- with help from Saudi princes and secret cells in the army -- attacked and took over the Grand Mosque in Mecca. The elite forces killed hundreds, but failed to dislodge the mosque uprising. Eventually the royal family requested backup from French forces to reclaim the holy site. On Tuesday, airstrikes hit a gathering of the Houthis in the western of Ibb, killing 20 fighters, security officials on the ground said. The rebels were assembling to head to Aden as reinforcements in the battle against forces loyal to President Abed Rabbo Mansour Hadi, who fled the country from Aden to Saudi Arabia last month. In Sanaa, death toll from of bombings Monday targeting rebel depots and weapon caches in the Fag Atan mountains overlooking the city rose to 38, medical officials said. The bombings flattened houses and sent villagers fleeing for their lives. The rebel-controlled Interior Ministry said 84 people were killed across the country in Monday's airstrikes. The casualty figures could not be independently confirmed. All officials spoke on condition of anonymity because they were not authorized to speak to the media. Saudi Arabia accuses Iran of arming the Houthis - a claim both Tehran and the rebels deny, though the Islamic Republic has provided political and humanitarian support to the Shiite group. For its part, the Shiite Iran has long accused Saudi Arabia of supporting Sunni militants, including the Islamic State group in Syria and Iraq. In remarks Tuesday, Iranian President Hassan Rouhani said he airstrikes in Yemen were prompted by the Sunni kingdom's failures elsewhere, causing what he called a "mental imbalance." Speaking to reporters before heading to Indonesia, Rouhani mocked Saudi Arabia by calling it a country with dashed dreams in Iraq, Syria and Lebanon. "All the failures have accumulated and caused mental and emotional imbalance for that country," Rouhani said. The remarks came a day after U.S. Navy said aircraft carrier USS Theodore Roosevelt was steaming toward the waters off Yemen to beef up security and join other American ships that are prepared to intercept any Iranian vessels carrying weapons to the Houthi rebels. The deployment comes after a U.N. Security Council resolution last week imposed an arms embargo on Houthi leaders. The Navy has been beefing up its presence in the Gulf of Aden and the southern Arabian Sea in response to reports that a convoy of about eight Iranian ships is heading toward Yemen and possibly carrying arms for the Houthis. Navy officials said there are about nine U.S. warships in the region, including cruisers and destroyers carrying teams that can board and search other vessels.